EWS Form 2018 is available on the official website of the Directorate of Delhi. 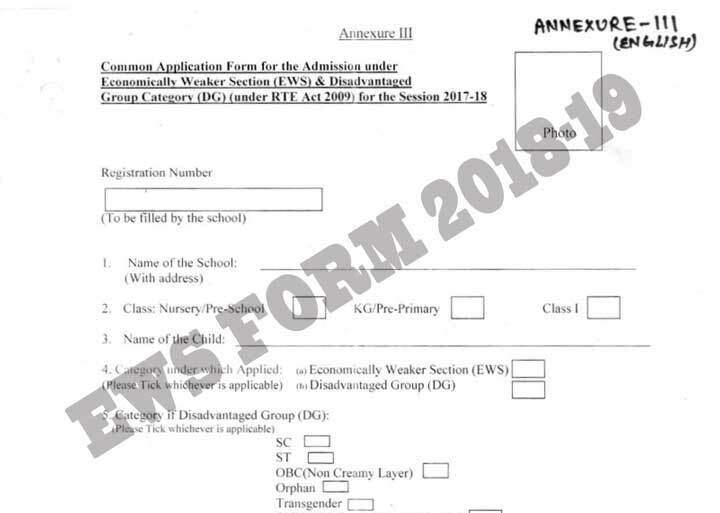 Parents seeking admission of their children in nursery classes in private schools of Delhi under EWS/DG category can now fill the EWS Online Admission Form 2018-19 through the official website. To download EWS Form 2018, click on the link below. Every year lakh of applicants apply for EWS/DG Admissions but only a few are able to get the admission in private schools of Delhi under EWS Category. The complete information on how to fill the EWS Form 2018 is mentioned here. The admission process was started on December 27, 2017, under which the children belonging to General Category were eligible to apply online for nursery admission through the nearby private school’s website for the session 2018-19. For EWS Category applicants the admission process is a bit of a hassle. For EWS Category the online registration was started in the second week of January 2018 (i.e 15 days after general category admission begins). The last date to apply online is January 17. Click here to check the detailed admission process and schedule. The online registration to fill EWS Form 2018 is a bit lengthy process. You can check this step-by-step guide to fill the online EWS Admission Form 2018. The online process begins on December 27 and the last date to apply online is January 17. The online Lottery Draw Result will be conducted in the month of February and March 2018. Applicants selected through the lottery draw result will get admission in the private schools under EWS Category. EWS Admission List 2018-19: The first admission list will be declared on February 15, Second admission list on February 28 and the third and final admission list will be displayed on March 15. EWS Admission List will be declared online at edudel.nic.in. Click here to check 1st, 2nd and 3rd EWS admission list 2018-19. Click Here for more information on EWS Admission List 2018-19. If you have any query or suggestion, write it down in the comment box below. We will get back to you asap.